Guitar is one of the most popular and widely used instruments. The guitar is popular because it is portable, flexible, polyphonicA polyphonic instrument is capable of playing chords, like a guitar or piano. and approachable. The guitar’s popularity makes it an obvious choice for many who wish to learn an instrument. And due to its popularity, there are many materials available to learn with. As far as portability goes, you can’t really beat the guitar. The acoustic guitar requires no amplification or electronics. It is lightweight, and can fit easily in the trunk of a car or even the overhead bin of an airplane. After transport, it requires little maintenance or assembly. All one must do is tune it, and it is ready to play. The guitar is a flexible instrument, whose tone and timbre are suitable for most styles of music. The guitar plays a central role in popular music, Rock, Latin, funk, jazz, and more. It has also made its way into most other styles of music as a cameo instrument. The guitar is a polyphonic instrument. This means that it is capable of playing more than one tone at a time, which means that it can be used to play harmonies. 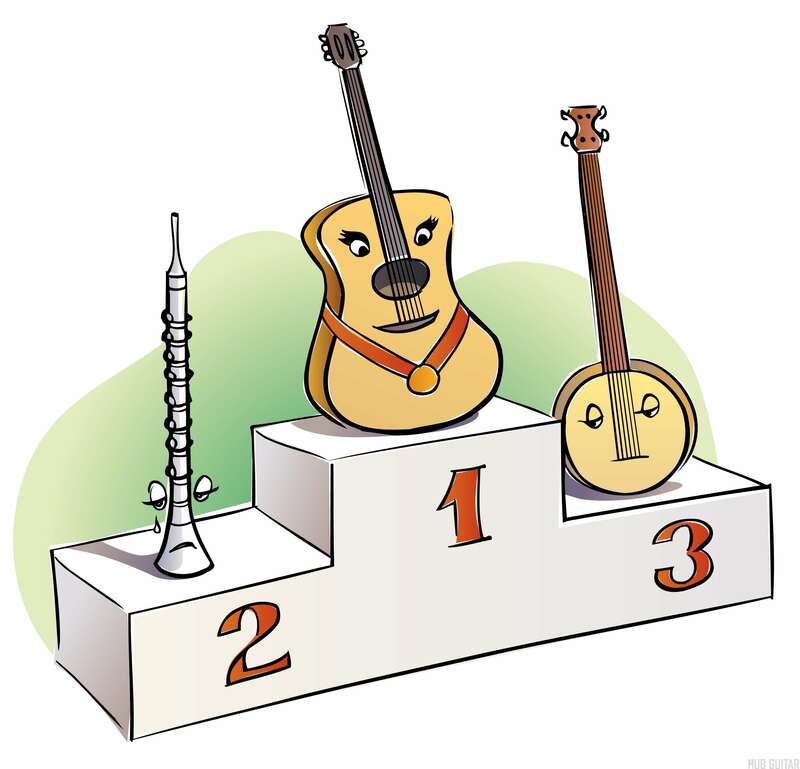 The only other popular instrument that excels at this is the piano. And of the two, the guitar is much easier to transport—and usually much cheaper to buy. The guitar’s range spans nearly 4 octaves, compared to about 7 on the piano. This range is particularly wide given the guitar’s smaller form factor. It can produce notes from the higher-register of the bass range and on up. Add a few extra low strings, and the range gets closer to that of a piano. And there are guitars with additional strings that can do just that (see: harp-guitar, 8 string guitar). The guitar can be considered approachable because it is relatively easy to learn to play the first note, scale or chord. The frets of the guitar provide a clear division between notes. In fact, one does not even need to know precisely where those points of division are. Unlike an instrument such as violin, which has no frets, it is relatively easy to play a correct note on the guitar. The guitar is also popular because it is used in so much music. In other words, the guitar is popular because the guitar is popular. When music learners want to start playing their favorite songs, they often find that the guitar is the best place to start, because it appears so often in popular music. Add to these lists of reasons one more: there are many books, instructional resources, websites and other learning materials available to learn the guitar with, and also many guitar teachers to choose from. Few other instruments have such a large base of resources available to learn from. Of course, if you like another instrument much more, there’s no need to force yourself to learn the guitar. You should follow your own intuition in choosing what instrument to play. Although the guitar may just be the best instrument for beginning musicians, it is not without its own shortcomings. Be careful to avoid the pitfalls of poorly constructed instruments, and of the misinformation you may find in some of the available learning materials. Although you may be able to find a guitar that costs $100 or less, that does not mean that the instrument is of acceptable quality. The market is flooded with many poorly constructed instruments. You get what you pay for. And if you want a decent instrument, you should probably plan on spending $300 or more. Guitars are not “all the same thing”. A quality instrument can easily exceed $1000. Misinformation is rampant among guitar learning materials. There are many tabs and tutorials that can be found for free on the web, but quality is often lacking. Indeed, the purpose of Hub Guitar is to fill the gap and provide professional quality learning materials for free online. You may also discover that much of the highest quality and well-edited material is still only available in books. Or, on members-only websites. Many who set out to learn the guitar find their progress hits a snag after they learn the first few chords. To continue to reach for higher levels as a musician, you’ll want to include purely instrumental guitar music in your repertoire. That includes both solo guitar, where entire arrangements are laid out for a single player, and ensemble guitar, where you will learn multiple parts such as melody and accompaniment in order to play a standard tune with a group of musicians.